Do any of our Canadian members have a link for Canadian issued handguns? Something from the start of the Confederation in '67 through WW2. I'm looking for not jsut military issue but NWMP/RCMP, substitute standard issue and any allowed private purchase arms. Also, a link to determine markings etc. would be great. 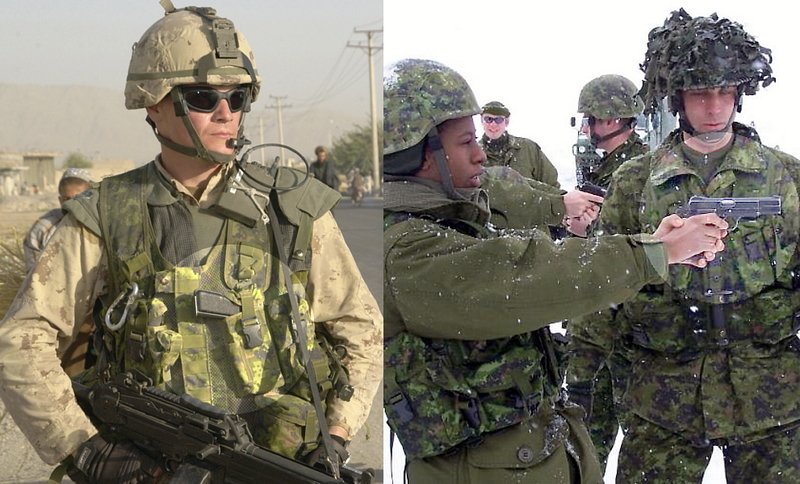 Re: Handguns of the Canadian army??? My reference for the Mounted Police is; Arms & Accoutrements of the Mounted Police, 1873 - 1973, 1982 Museum Restoration Service, Roger Phillips & Donald Klancher. For the Canadian Military see; Canadian Military Handguns, 1855-1985, 1994, Museum Restoration Service, Clive M. Law. Rattlesnake Jack may have some other references. For the Mounties the short list is; Adams Mark I in .450 Adams, Enfield in .476, COLT NEW SERVICE in .455 and .45 Colt, various .38S&W breaktop snubbies (carried by railway guards in the Yukon), and almost any S&W or Colt revolver in .38 could be found somewhere, as the NWMP absorbed the Dominion Police and several Provincial forces along with their kit. Oh Yes; Sam Steele carried his own C96 Mauser in South Africa. 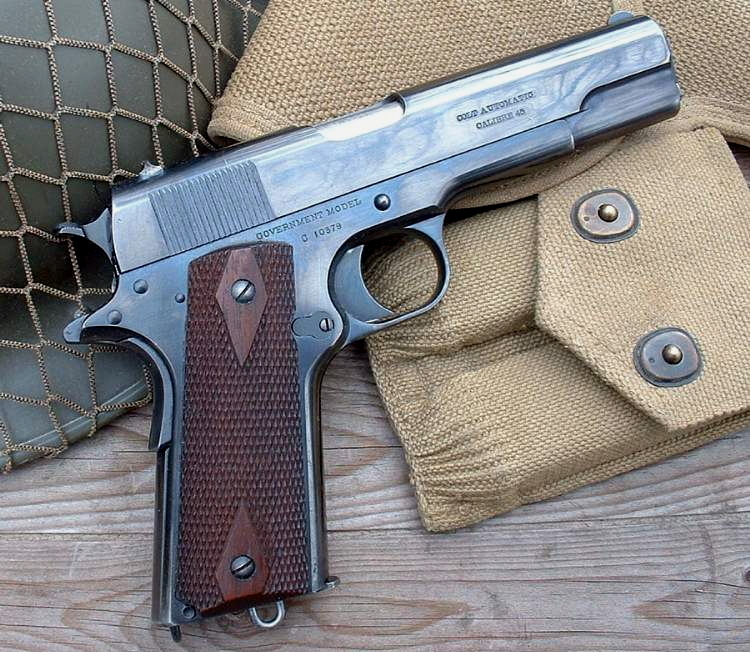 For the military, a very short version is the following list; 1851 London Colt, 1878 Colt in .45 Colt, Any British sidearm as they came and went, Colt New Service in .455 as well as the S&W equivalent, Colt 1911, S&W "Victory" and M&P, Browning Hi-Power as made in Canada by INGLIS ( still in widespread issue). Another source, slightly off your query is; Defending the Dominion, Canadian Military Rifles, 1855-1955, 2003, Service Publications, David W. Edgecombe. Re: Handguns of the Canadians??? Sir Charles....thanks! I about fainted when I checked Amazon for the first one...$547! Fortunately there were some new paperback copies at a more reasonable price. BTW, is there a book on Canadian uniforms and equipment pre WW1? I know they issued the leather Oliver equipment but I don't know much about it. Oliver equipment was designed in Canada. It was used in the Anglo-Boer War by the First Contingent (RCR) with the very distinctive single rifle ammo pouch "front & centre". It persisted until 1916 with an attempt to correct some of the drawbacks of the Oliver pattern, but never really caught on as the C.E.F. in France went to British issue as being vastly more practical. That about exhausts my knowledge on this topic, but I do have an Oliver Pattern waist-belt, modified with the 1916 changes to sport my Ross bayonet. What Price Glory has Oliver and 1916 items. I am currently 1100 miles from home, attending the Grand Army of the Frontier National Muster, but can make some specific recommendations, and post pictures of handguns, etc. when I get home. 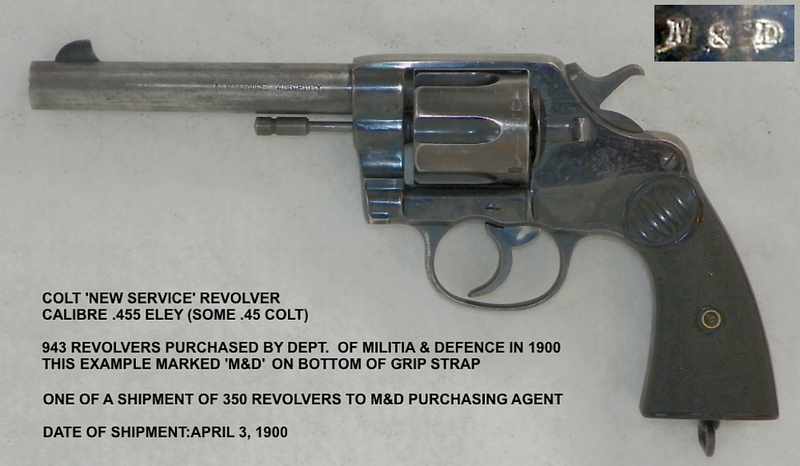 On the handgun question, Sir Charles has omitted the Colt New Service revolver from his listings of primary-issue handguns of both the Canadian military and the Mounted Police. 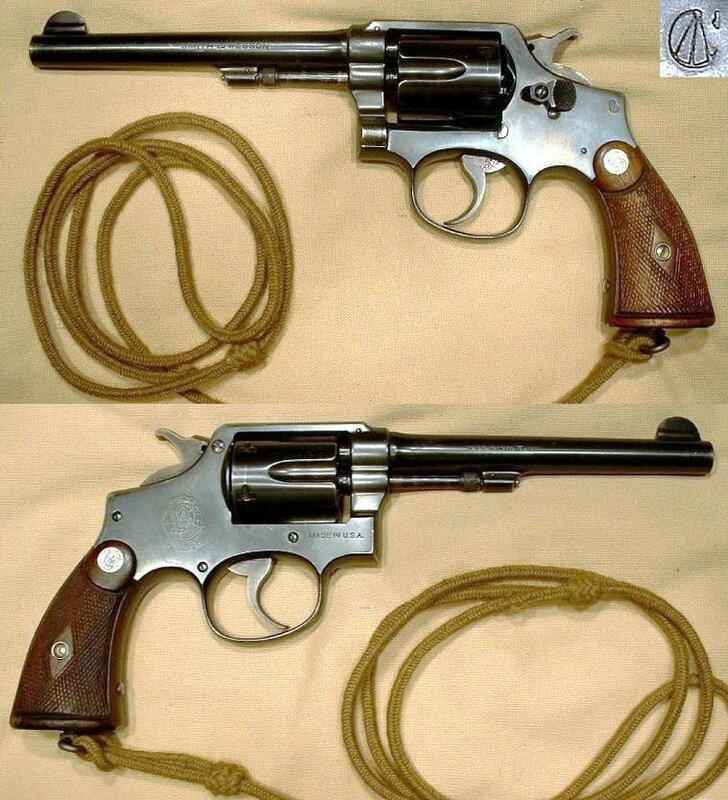 Canada acquired a number of these revolvers in 1900 for Boer War service, the first ones being chambered in .45 Colt (same as the Model 1878 Colts which had bee acquired in 1885 for use during the North West Rebellion, which were issued to the First Contingent of troops sent to South Africa) but later chambered in .455 Webley at the request of the British Command. 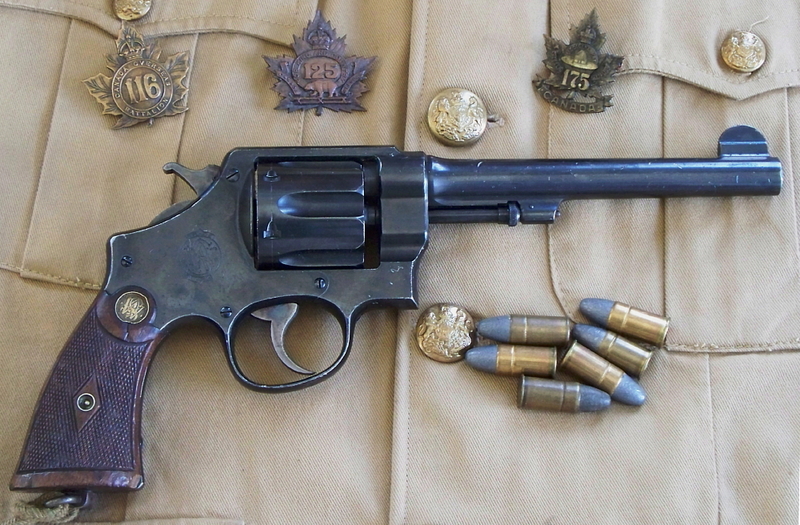 The New Service was also adopted in 1905 as the service revolver of the RNWMP ( initially these were .455, so they could use the same ammunition as the Enfield revolvers they were supplanting, but after amalgamation with the Dominion Police in the early 1920s to form the RCMP, purchases were all (or at least almost all) in .45 Colt, with the stipulation thar the .455s would be used in the west (i.e. the former jurisdiction of the RNWMP) and the .45s in the East. The New Service remained the standard-issu e sidearm of the Mounted Police until (I believe) 1954. Thanks RSJ; I missed the Colt New Service in the mounties list as I attempted to untangle a typo. Now corrected. I did refer to it in the military list. 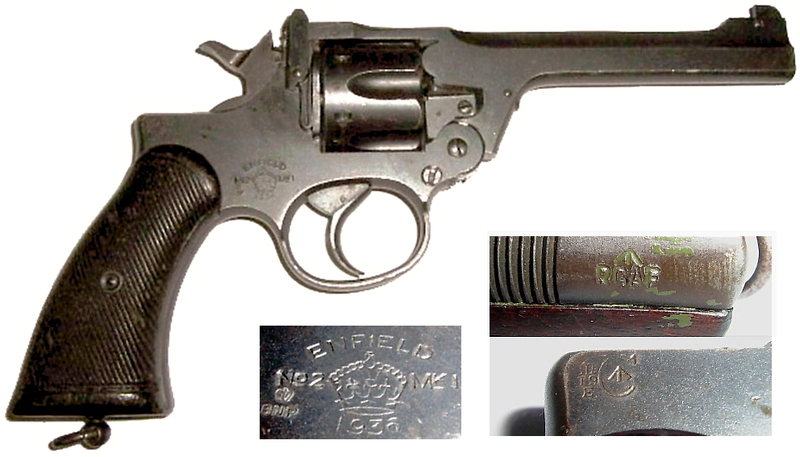 British firearms were acquired privately on occasion and were issue items for RC (Royal Canadian) units raised directly or for Imperial service. An example is the Cavalry Brigade in WW I, which served as part of the 2d Indian Army Cavalry Division in France and later switched to the 5th and later the 3d British Cavalry Division. The RCN had many Webleys in .455, as they came with the stowage of each RN ship manned by the Canadians, most serving during WW II as well. Those are some great links..thanks!! I have googled Oliver equipment and found almost nothing but apparently somehow your links are based in Canada...Yahoo Canada? I never knew. Say what? Webley was never adopted as a standard side arm? They did not even issue many? What was the standard Canadian side arm of WW1? WW2? I always figured those large web holsters were for Webleys. Thanks for this info. I have a couple of New Services but neither has any Canadian history. i suppose that the Canadian markings were not clear cut on the military ones. No "property of the CEF" or "property of the Canadian Army"? The web holster patterns used by both the UK and Canada fit the large-frame and small-frame S&W revolvers used by Canada in WWI and WWII. RsJ...thanks! That is a great collection and some great pics. I did not realize that Canada used so many US hand guns...I love that 1911. Is it M&D marked? I was eyeing a S&W hand ejector in .445 Eley that I think was Canadian issue. Sadly it had been re-chambered in .45 Colt. I still should have jumped on it but I could not get a decent picture of the markings. We do have a lot of Inglis Hi Powers floating around the states. I wish I had bought a couple when they were cheap but I was not into Canadian stuff back then. Oh well....one will come my way. I have a couple of Canadian long arms. A Martini Henry and a project LEC 1. It was a stock/bolt/action that was re barreled. I have a forend on it from a No1mk3. I need to sort out a handguard for it. Sort of an officers private purchase carbine. I was eyeing a S&W hand ejector in .445 Eley that I think was Canadian issue. Sadly it had been re-chambered in .45 Colt. I have one of those. It is really quite nice. Hamilton Ontario used to have a chapter of the Grand Army of the Republic. One of Custer's officers at the last Stand was a member there, or at least from Hamilton. Cross border associations have a history as long as the history of these two nations. You must be referring to 1st Lt William Winer Cooke, Custer's Adjutant. Cooke served during the Civil War and eventually ended up with the 7th Cavalry. Cooke was from Mount Pleasant, Ontario, just outside of Hamilton, Ontario. He was killed with Custer on Last Stad Hill at the Little Big Horn (LBH) and is now buried in Hamilton. In 1999 I was at the Auction in Red Deer, AB where Cooke's gun, holster, and farriers knife that was taken by the Sioux at LBH was up for sale by Cooke's great-nephew, Blake Cooke. The items were recovered by the NWMP when the Sioux escaped into Canada in 1877 and were returned to Cooke's family. The items sold for $60,000 Cdn to Art Unger of Hicksville, NY. I had the pleasure of handling the items just before the sale and it was kind of neat to be holding actual LBH artifacts from a known participant. Yes, if one recognizes the Hi Power as an American design then ALL of our primary-issue handguns have been "American" since 1855! My Colt is, indeed, gorgeous - in this photo, that is the reflection of overhead tree branches you see on the high-polish fire-blued slide! However, it is not M&D marked. 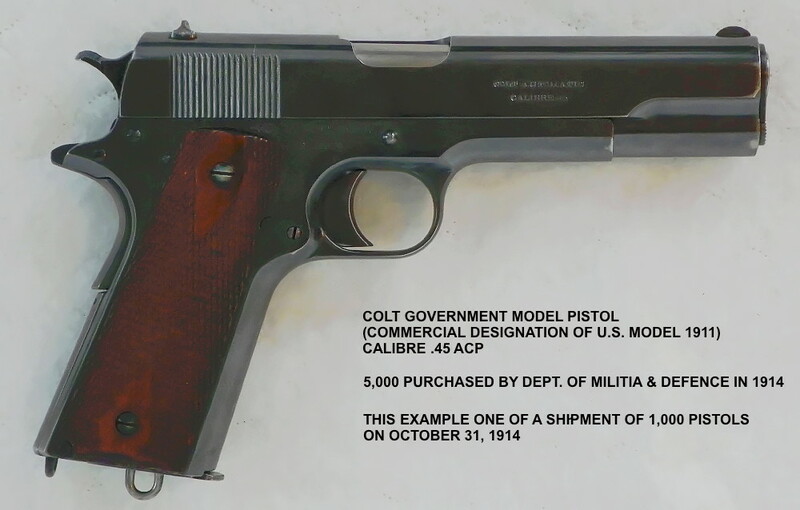 The majority of the surviving examples of the 5,000 Colt pistols acquired in 1914 do not have government ownership marks, because they were sold on to officers (who had to supply all of their own uniforms and kit at personal expense) and thus became their private property. 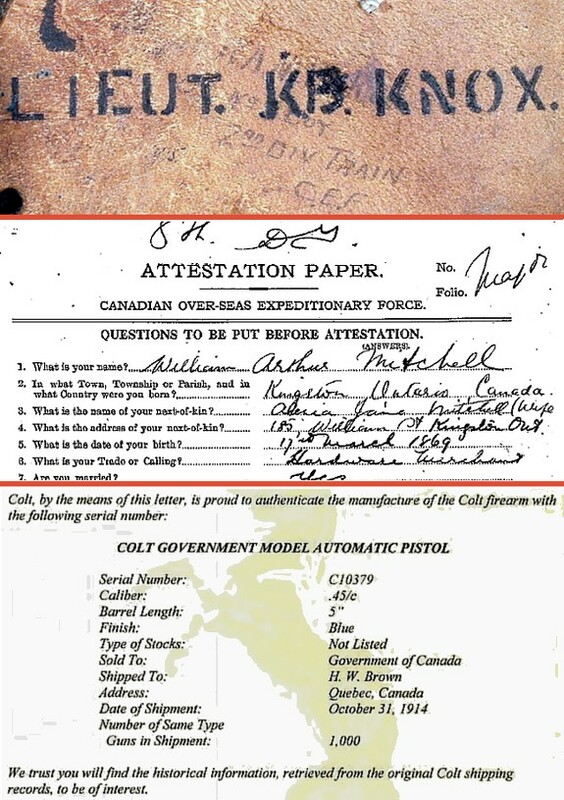 Mine is such a pistol ... the Colt factory letter confirms it was part of an October 31, 1914, shipment to the Government of Canada purchasing agent comprising 1,000 pistols, but it became the personal sidearm of Major William Arthur Mitchell, who served in the Army Service Corps component of the Canadian Expeditionary Force. Inked inscriptions on his original leather holster (underside of the flap and on the belt loop on the back) read: "MAJ. W.A. MITCHELL - O/C No. 5 COY. - 2nd DIV. TRAIN - C.E.F." and an inked "1915" can also be made out to the left of that inscription under the flap. (Interestingly, Mitchell's Attestation Paper, volunteering for service in the C.E.F. 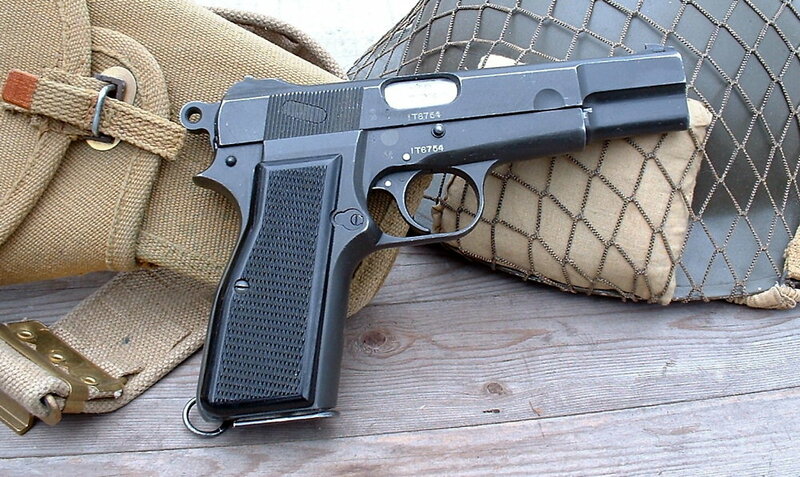 is dated November 1, 1914 ... the day after the pistol was shipped from the colt factory.) That inked inscription is overlain by a stencilled: "LIEUT. K.B. KNOX", identifying the chap who purchased the pistol and holster from Mitchell (a family friend, by then in his seventies) during WWII, upon being commissioned as an officer followings his graduation from university (which was in 1943, if I recall correctly). I acquired the pistol and holster directly from an elderly Ken Knox some years ago. Something like that is a center piece of a collection. Really a one of a kind find. Yes, indeed ... I am proud - and humbled - to be the custodian of this piece!